Increased funding for nonpublic school students is in jeopardy for the coming school year — specifically in the areas of bus transportation, nursing and technology services. To learn more about how the proposed budget affects South Jersey Catholic School students and their families, the Catholic Star Herald met with Dr. George Corwell, who represents Catholic schools for the New Jersey Catholic Conference (NJCC). What is the New Jersey Catholic Conference and what is your role there? The NJCC is the public policy arm of the Catholic bishops of New Jersey. When the bishops speak on a public policy issue, they do so through the Catholic Conference. We testify before legislative committees and have ongoing meetings with legislators and their staff. I handle all the education issues. What is the pressing funding issue for families whose children go to Catholic school? There were several legislative “add-ons” to the 2017-18 fiscal year budget for many constituencies. 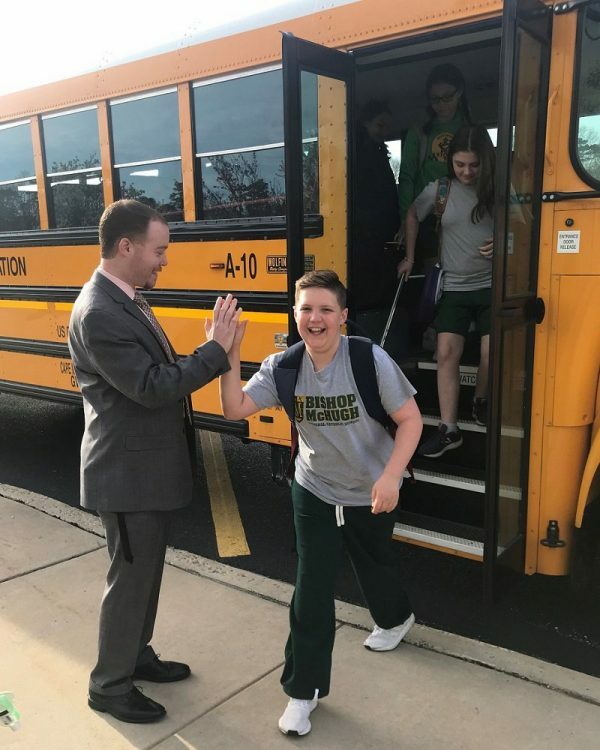 For nonpublic school students, add-ons included increased funding for bus transportation, technology, nursing services and security. The Governor’s preliminary budget excludes all of those add-ons except security. The net effect is that funding in the other areas will revert back to 2016-17 levels. In the case of bus transportation, the per-pupil amount will return to $884, where it was frozen for seven prior years. How is busing arranged for nonpublic school students? The state provides funding for bus service for elementary school students who live two or more miles from school. High school students are eligible for state funds if they live two and a half miles or farther. Additionally, for nonpublic school students, the district where they live must already bus public school students within those mileage limits. Busing for nonpublic school students is arranged either using district vehicles or those of private bus contractors. The $884 allotment does not cover the cost of all routes — a situation that can lead to termination of a route. There are many families who simply cannot find an alternative transportation option. It’s truly unfortunate when a family has to leave a school of choice just because of transportation. With separation of church and state, how are nonpublic school students eligible for state funds? No funds are available for religious materials or instruction. Also, the money isn’t given to schools. It benefits parents and students for limited services that are essential no matter where a child goes to school. Legislators recognize that parents are taxpayers. Parents are paying tuition for their own child to go to school and also paying taxes for the public school. Nonpublic school parents receive minimal benefits for their tax dollars. Can you explain how taxpayers save money when students go to private schools? The yearly cost to educate a child in a public school varies from district to district, but the average cost in the state of New Jersey is almost $20,000 per student. Now imagine if the 12,000 or so students in South Jersey Catholic schools suddenly moved to public schools. Their parents already pay taxes, so there would be no additional money coming in, but the state would spend about $240 million to educate them. The state and taxpayers definitely benefit when families don’t avail themselves of public schools. What’s the best way for people to reach their legislators? Does it really make a difference? It absolutely does make a difference. The easiest, quickest way to make your voice heard is to use Voter Voice at www.njcatholic.org/faith-in-action. Ask parents, grandparents, other relatives, neighbors, and friends to get on board, too. Legislators have told us that flooding their emails gets their attention. You can also send emails directly and include a more personalized message. Contacting the office with courteous phone calls is another great tactic, and if you have a chance to meet in person, all the better. Look for opportunities at town halls or other events your legislators will attend. If there are any upcoming class trips to Trenton, get in touch with your legislators or members of the budget committees. The nonpublic school community has had conversations with legislators who are very supportive about restoring funds on behalf of nonpublic school students. Truly, they are listening.